At Resilience of Sacred Places: Defining Security — dialogues held over two evenings in July 2015 hosted by the Sacred Land Film Project and the David Brower Center in Berkeley, California– four Native American women spoke about their perspectives of homelands and security. Ann Marie Sayers, Mutsun Ohlone, was born and raised in Indian County. When speaking about security, she alluded to the bounty on the heads of the Native American people during the Gold Rush, stating that now is the best time to be alive as a Californian Indian. Because Indians are now able to practice their cultural traditions, Sayers offers her great-grandfather’s trust allotment to all Indigenous Peoples who need traditional lands for ceremonies. Corrina Gould, Chochenyo Ohlone, is a co-organizer for Indian People Organizing for Change. She explains that her view on security is tenuous, because she belongs to a tribe that is not federally-recognized. Gould stated: “I don’t feel secure because the federal government does not recognize us as human beings. We have to fight those who see us as a special interest group but not as American Indians who have homelands here.” She tirelessly fights for her tribe’s acknowledgement and awareness. Recently, Gould has been working to raise awareness on the removal of ancestral burial grounds and shellmounds throughout the Bay Area. One of the largest shellmounds in the area was removed in Emeryville to make room for a shopping mall. Currently, the remains of Gould’s ancestors are stored away in the possession of University of California, Berkeley. Gould’s vision now is to create a first Native women-led land trust, where the ancestral remains stored at UC Berkeley and other museums can be re-interred. Gould said the removal of burial grounds was a way of perpetuating cultural genocide, an attempt to strip away notions of identity, “security” and dignity. Pennie Opal Plant is a descendant of Yaqui, Cherokee, Choctaw, Mexican, and European ancestry. She defines security as a state of health and balance of “all life on Mother Earth’s belly”. Opal Plant works to draw attention to the conditions of communities at the forefront of the refinery corridor of the Bay Area, where five major oil refineries operate. She co-founded Refinery Corridor Healing Walks, along with members of San Francisco’s chapter of Idle No More, to present the environmental and health threats fossil fuel industries possess toward community safety and security. Chief Caleen Sisk is the tribal and spiritual leader of the Winnemem Wintu Tribe. 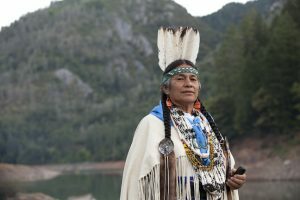 The Winnemem people are also known as the middle river people, and have an inextricable link to water. Their ancestral homelands are located over millennia along the McCloud River, so water is very sacred. However, the Shasta Dam of McCloud River disrupts the sacred sites and burial grounds of this tribe. Chief Sisk has been a vocal opponent against the proposal of raising the height of the dam. Raising the height would further destroy the remaining sacred sites of the tribe. For Chief Sisk, security is the health of the water of the McCloud River. This article first appeared in Indian Country Today Media. To access the original, full length story by Rucha Chitnis, click here.